During the POWAMUYA ceremony in February, the katsinam arrived in force to help the Hopi prepare for the next growing season and to initiate children into the Katsina Society, thus preparing them for growth as well. This important ceremony is a series of rituals that promotes fertility, germination, and early growth of seeds. Now March is the time of the Night Dances by Katsinas in the kivas. These occur in the underground kivas and are NOT open to the public. Hopi Dancers At Night by Raymond Naha, 1933-1975, was a Hopi-Tewa artist who studied with Fred Kabotie at Oraibi High School. 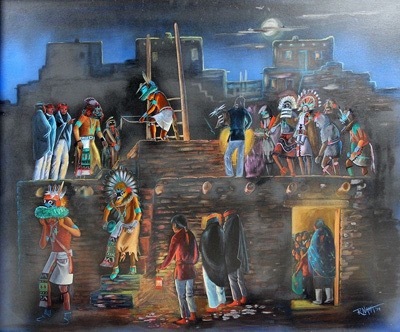 He is known for his ability to paint the smallest aspects of Hopi life in great detail. “During this season, the katsinam perform beautiful dances at night in the villages to create a pleasant environment for all life forms so that they will grow and so that rain will come to nourish the crops. The katsinam are always watching and listening for humble prayers and meditations during the Night Dance season, which lasts from now until some time in July. The dance series may go on until just before dawn. It is usually windy and cold. The next day we have a great feast and families visit with each other. A great learning opportunity to listen to Hopi speakers live on Hopi radio. There is profound wisdom and spirituality embedded in the Hopi agriculture tradition. The Natwani Coaltion Mission: To preserve and strengthen the healthy food system and agriculture traditions of the Hopi & Tewa people. In November, December, January and February we made 6 deliveries to Hopi families, the most we have ever done! We did our 15th annual Winter Gifting Project in 2 deliveries this year. A big thanks to the expanded potent team of volunteer helpers and the donations (including driving vehicles and a trailer and donating gas for the many deliveries) that made this possible! This took a terrific amount of focus and energy to do the local outreach, collect, package and deliver. We also initiated a new program of special support for 29 families in special needidentified by a new Hopi team member, Jolene Johns, who guided us in making 4 deliveries to this group beginning with winter coats and food in November, then 2 rounds of major staple foods and another delivery of sweat suits for all the kids in these families and gifts that overflowed from the Sedona community at our last donation table in December. We particularly thank a locally based donor team who supported 2 of the food deliveries and personally shopped for, packaged and delivered the sweatsuits. Sandra Cosentino has been coordinating for several weeks with a boy scout troop leader from Utah to bring their group of junior-senior high youth to do service projects at Hopi for 3 days. We are making plans to haul needed supplies (thank you to our team members who have volunteered to do this!) to help a Hopi family make an outdoor bread oven and underground baking pit. The youth will also help load and haul native stones and clay to make these traditional structures. The youth will also assist two Hopi farmers in preparing their fields for planting and do projects on the four Hopi Head Start playgrounds. We are supporting Hopi Tutsqwa Permaculture and Hopi Head Start in the June planting of fruit trees, edible shrubs, wind breaks at the Polacca playground. Back Yard Edible Landscape project: we also have initiated planning to do a demonstration and teaching project for 1 or 2 Hopi families to increase sustainable food supply. This takes special planning to provide for rain water catchment and the fruit trees will need a drip system in the first few years. The weather is much dryer at Hopi now than a few hundred years ago when hardy native and Spanish introduced fruit trees were grown by dry farming from seed stock. and Susan Secakuku, Secakuku Consulting and a Hopi tribal member. Joe Seidenberg, in his very informative presentation, said that sustainability is the key factor in the work they do at Hopi–how can Red Feather make a lasting difference? It is important to build relations with community members and offer a “hand up, not a hand out”. The goal is to empower Hopis with skills training and support to begin to address the long list of deficiencies in Hopi housing. We really thank them for this excellent, informative program, and for taking time to come down to Sedona from Hopi and Flagstaff. Deborah Williams and Sandra Cosentino made a follow up trip to Flagstaff to get more details from Joe on ways we might be able to coordinate with Red Feather on small projects that will support individual Hopi with homes in need of home maintenance and repair. He gave us many helpful tips based on his years of dedicated work on the ground at Hopi. We have a generous donation to help with repairs and will be determing project(s) that we will do in support of improving safety, function and liveability of Hopi homes. ~ Archaeology Exhibits and Demonstrations including prehistoric astronomy. ~ Lectures on Hopi Migration (Eric Polingyouma–photo to right–has spent a large portion of his life examining and discovering migration paths from Guatemala and Oaxaca, seeking shared symbolic traditions or possible Hopi clan symbols during his travels–see photo to right); Lindberghs 1929 aerial survey, rock art of the Southwest meanings and more. Camp Verde Heritage, Pecan & Wine Festival going on next door. Both are free admission.